When we travel, I keep a detailed journal of the places we visit and the things we do, down the details of what we ate and drank. There are feelings in there too. What would a journal be without feelings? So, when I decided to use this photo for this entry, I turned to the journal I kept during my first trip to Portugal and found the entry corresponding to the purchase of this coffee set: July 16, 1997. Luisa and I had driven up north and had stayed in a little pensão for two days while visiting Peneda-Gerês National Park. We were on our way back to Luisa's father's home and we stopped in Barcelos which had a small shop that sold locally made pottery. 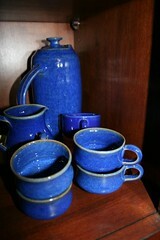 I saw this coffee set and was so mesmerized by the color that I had to have it. We have never used it, yet it sits in my china cabinet and I notice it nearly every time I pass by. It reminds me of warm summer winds and vinho verde and olive trees and old stone bridges covered in moss. It reminds me of a moment in time...a moment when it was just me and Luisa and we had all the time in the world. Remember to clicky click over in the sidebar and vote!